In home video as well of cinematic terms, F.W. Murnau's Sunrise is a film of some significance. Not only is it the first Eureka title to receive not just a second but a third DVD release in the UK, but it has also, unless I'm very much mistaken, just become the first silent movie to be released on UK Blu-ray. It's a marvellous and genuinely visionary movie. OK, this is an opinion rather than a fact, but a widely held one that is shared by everyone I know who has seen the film. Of course, this would only provide justification for the first DVD release, but you have to tie this in to the next two, so bear with me. Although sourced from the same 2003 Fox Film Library restoration as the transfer on the 2005 Masters of Cinema disc, this new edition has been transferred from an HD master overseen by Fox in 2008 rather than the standard definition master used for the previous release. Recently a print was discovered in a Czech film archive that is sharper than the more commonly seen Fox restoration and different enough in content and structure to almost warrant a release of its own, and this has been included both the new DVD and the Blu-ray. Of course, if you bought that first release and were a little galled when a second version came along that was superior to the one you'd paid out for, then the news that a third and even more impressive release from the very same company was on the way may well have raised a few hackles. But the new Fox HD master and the recently discovered Czech print really do justify both this new DVD and (especially) the Blu-ray. The improvements to the Movietone version (more on this below) are welcome, but the key new inclusion here is the Czech print. 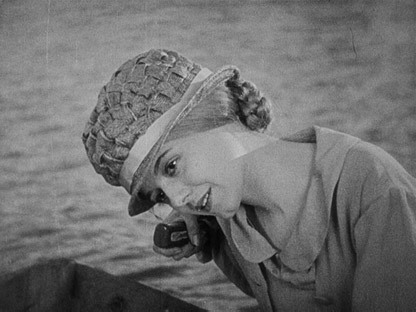 As well as the image being significantly sharper than on previous home video releases (including the one Movietone print included here), the Czech version is constructed from alternative takes to those used in the Movietone version and the timing of edits and even placement of shots within the timeline are both noticeably different, though some shots and even scenes are actually absent here, resulting in a running time that is fifteen minutes shorter. It should be noted that despite the alternative takes, altered editing and missing footage, this is essentially the same film – the differences are all in the detail, which would be a little redundant to start listing at any length here. Even if you've only seen the Movietone version a couple of times, you'll soon find yourself spotting the differences between the two versions. It's also worth noting that the aspect ratio is 1.37:1 rather than the 1.20:1 of the Movietone print, which adds picture information to both sides. I've already covered the film itself in my review of the 2005 release, which you can read here. The focus here will be elements and content unique to this edition. The decision to not undertake any major digital restoration and noise reduction was made after tests revealed that it had a negative effect on what the accompanying booklet describes as its 'sfumato' quality, a word I had to look up but appears perfectly chosen (for those also in the dark, it is, as defined by my desktop dictionary, "the technique of allowing tones and colours to shade gradually into one another, producing softened outlines or hazy forms"). This does mean that there is a lot more dust and damage than on the more polished restorations of silent cinema from the likes of Murnau-Stiftung, but is, as the booklet states, exactly how the film would look if projected theatrically. While there appears to be little difference in picture sharpness between this new transfer and that on the previous Masters of Cinema release – both are a little soft on detail – other aspects have been considerably improved. The picture unsteadiness of the 2005 release has been almost eliminated here, while the almost constant exposure instability of that release has been more consistently rendered. A good demonstration of the changes can be found at the start of chapter 5, as The Woman of the City holds The Man in her arms by moonlight, a shot that now sits rock solid in frame and has almost no trace of its former flickering. The picture is also slightly lighter here and the contrast a touch less strong, resulting in better shadow detail. Back in 2005 I sang the praise of previous transfer, but subsequent advances in restoration technology and the silent cinema DVDs on which it has been strikingly demonstrated have upped the bar somewhat, and on these two elements at least, the new transfer lives up to the raised expectations that news of a new transfer tend to create. Watch the Movietone version first, however, and the Czech print proves a real eye-opener. Although picture and exposure stability are not as consistent here and there is a little more print damage, the image is visibly sharper, which is particularly evident on the Blu-ray. 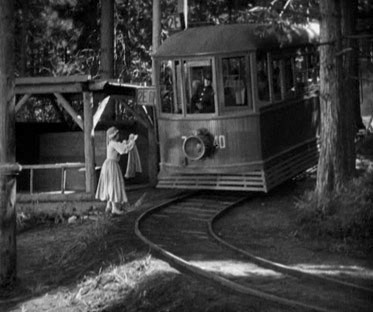 The above-mentioned shot that begins chapter 5 on all 3 discs demonstrates this well, particularly in the facial detail (stubble, eyelashes), as do the fishing nets that open chapter 6 and the woodland detail and panelling on the tram at the start of chapter 9. We're still not talking modern movie sharpness here, but the jump over previously available video versions is significant. The contrast is a little stronger on the Czech transfer, but it also has a little more punch. It's also brighter and with better shadow detail, but the Movietone transfer somehow feels more correctly graded. One side effect of high definition crispness is that the film grain and damage are more visible on the Blu-ray than on the DVD. As stated above, the framing is 1.20:1 on the Movietone version and 1.37:1 on the Czech print transfer. The DVD frame grabs below give an idea of the differences between the two prints. Note in particular the alternate framing and positioning of objects and characters within frame. If you know the film well enough, you'll be spotting these throughout the film. The soundtracks on offer are the same as those on the 2005 release, with the option of the original mono Movietone score or a newer stereo score by Timothy Brock. I've already expressed my preference in my review of the earlier release and I stand by it here. A slightly trimmed version of the Movietone score has also been used on the Czech version. As far as I can tell, the extra features included here are exactly the same as those on the 2005 DVD release, which I've already commented on here. All are on disc 1 of the DVD version, but the trailer is reproduced on disc 2. The only difference here is the accompanying Booklet, which is not a reproduction of the one from the 2005 release, but a slimmer affair containing an essay on the film restoration, an examination of the differences between the Movietone and Czech versions, and has a brief intro to the 2009 DVD, as well as the expected film credits and high quality stills. OK, you bought Eureka's original 2-disc release and the 2005 Masters of Cinema version with the restored print, so why should you cough up for a third release of the same title? Well it really does depend on your fondness for the film itself. The extra features are almost identical, the supplied scores the same, so it's all down to the new HD transfer of the Movietone version and the Czech print, and for devotees of the film this will be enough, for improved picture stability on the former and for the increased detail and alternative takes and edit on the latter, which are particularly well served by the Blu-ray release. If you've yet to buy the film on disc then you really are in luck, as this is definitely the version to go for, with the increased crispness of the picture on the Czech print giving the Blu-ray a definite edge over the DVD. Despite those previously available versions, this still has to come strongly recommended.